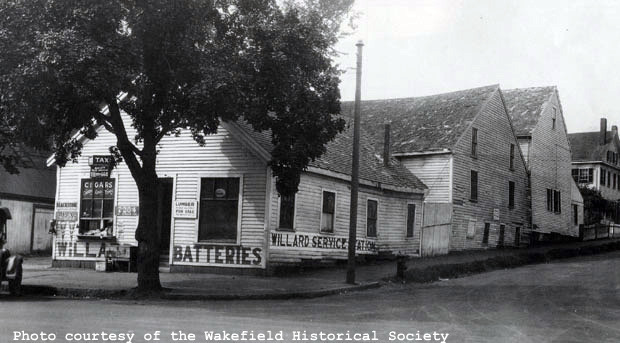 "Referred to as the old Bessey Stable, this wooden building at the corner of Main and Chestnut Streets was torn down by the Central Building Wrecking Company of Chelsea in late September 1923 to make way for the Wakefield Trust Company building. The stable was considered a landmark and its removal marked an important change to Main Street. The building housed the Willard Service Station at the time of its demise. William W. Bessey operated the stable for many years under the name of W.W. Bessey & Son. The property was purchased in August 1921 by Wakefield Theatre owner Charles W. Hodgson for the purpose of building a playhouse. The project was abandoned in 1923 and the property was purchased by the Wakefield Trust Company that same year. The second-hand lumber and all building material were sold 'cheap on the premises' or at the company's Chelsea yard. The company also listed firewood and 150 squares of Munson slate as part of the sale." - Text from calendar by Jayne M. D'Donofrio. “Bessey Livery Stable, corner of Main and Chestnut Streets, September 1923,” NOBLE Digital Heritage, accessed April 20, 2019, https://digitalheritage.noblenet.org/noble/items/show/6875.